Written by Janet Choi on March 24, 2016 .
we moved from being transaction-oriented — the investment and training had been all around how to complete the transaction — to building on the relationship with the customer. Building relationships and fostering that sense of advocacy in customers relies on following up and continuing conversations. Here are some ideas for how to use NPS surveys to build stronger relationships with your customers and increase engagement, reduce churn, and strengthen retention in the long run. Simplicity is the NPS survey’s strength. 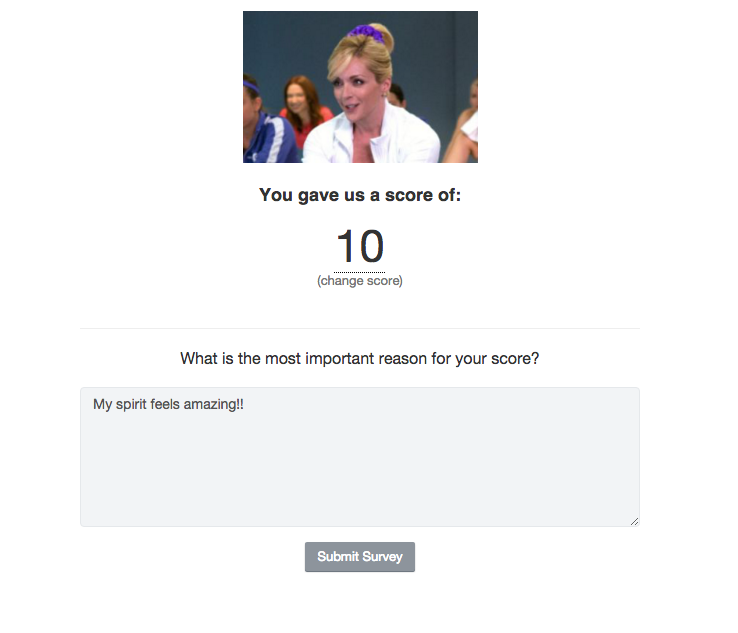 The survey is one question — a rating between 1 and 10 — followed by an optional open-ended question asking for a quick explanation of the rating. The lightweight nature of the ask makes it easy for people to respond. any score that is above zero is good, anything above +50 is excellent, and over +70 is considered world-class. NPS is not about the score itself. It is about listening to your customers and helping them solve their problems. It is often overlooked to follow up immediately on every response. You can resolve unsatisfied customers’ problems and effectively reduce their churn with NPS. What exactly are you trying to do with our product? How is it falling short? You can continue this conversation over email or offer to hear customers out on the phone to really hash things out. If they want a feature that’s coming out soon, give them a peek at your product roadmap. This will have the residual benefit of making them feel cool and included for knowing where your company is going. You could also offer to put them in a beta or tester group. If they have a specific problem that you can address, whether with a workaround, further education, or a future fix — tell them about it! If their problem is solvable through an integrating or another service altogether, then be honest and tell them. You may lose a customer but in leaving a trustworthy impression, you may create a brand advocate or engaged audience member. Passives are not “good” customers. They are stagnant in most cases, highly susceptible to competition and as many as 40% will churn just like detractors, only over a bit longer period of time. Companies send customers free swag like t-shirts and mugs to boost retention, and it works. But don’t view this as a quid pro quo interaction. Instead, offer a token of your appreciation for their patronage and feedback. To automate some of this process, you can set up event-triggered internal notifications in Customer.io when a customer gives a certain score. Another option is to get addresses from tools like Clearbit or your customer records to use services like Startup Threads, which can ship your company’s swag directly to your customer. Passives are generally more price sensitive than promoters. For instance, loyal Apple devotees will shell out whatever it costs for the next iPhone, but lukewarm Apple buyers might switch to Android when they see how much lower the prices are. But offer them an upgrade or a coupon — and they might stick around long enough to have a better experience of your brand’s core value. 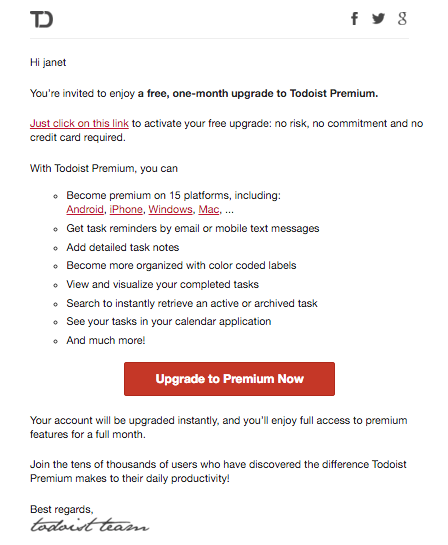 While writing the email offering the free upgrade, there are three main points you want to express: that this is something that carries no risk, the value and benefits, and that this is something trustworthy that other users have paid for. 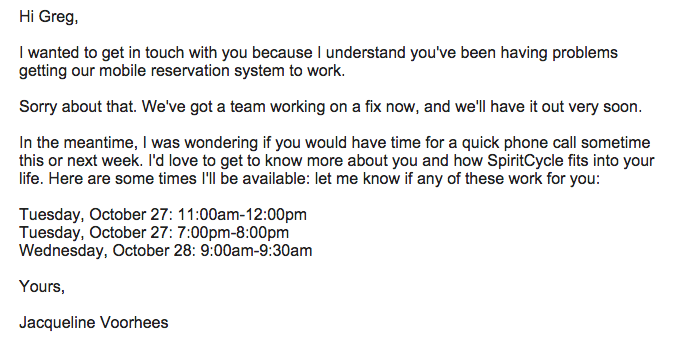 Here’s the type of upgrade offer you could adapt for a survey follow-up. Your 9s and 10s are your ideal customers. But that doesn’t mean you should be satisfied with just seeing 9s and 10s on your surveys. Nurturing your most engaged customers is a smart business move, as American Express found. Taking your best customers for granted is a regrettable way to lose them and what’s more, you’re missing out on gaining valuable insights about what makes them tick and leverage for further growth. Some of the best strategies for the passive segment can also apply to your promoters: it’s about strengthening relationships. So you might want to start with a nice “Thank you” note with some swag, helpful content, or a promotion. Offer your promoters a chance to upgrade their service, either for free or for a discounted price. Even if it’s just temporary, aiming upgrades at your promoter segment increases the chances that they’ll take part, and in the long run will improve your chances of retaining them. 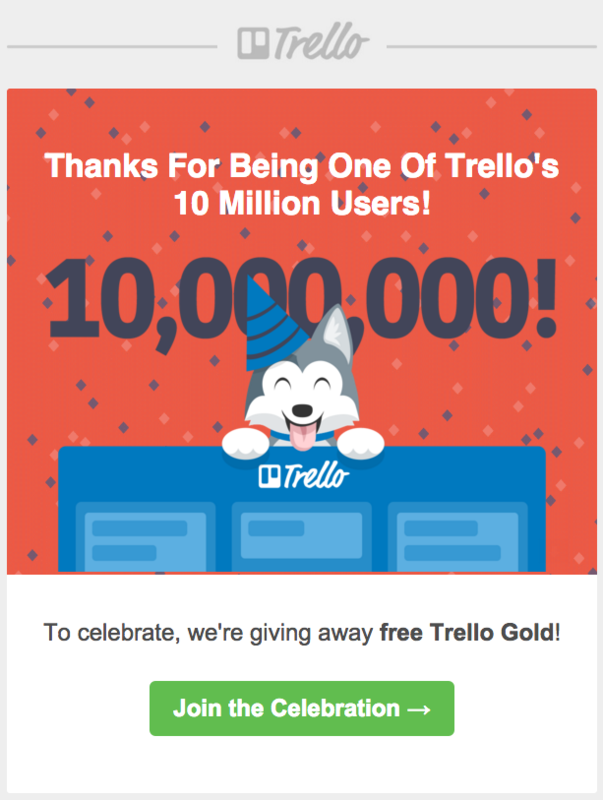 Trello offers a free month of their Gold service for every user that you refer to their service, and recently, after hitting 10 million users, they gave away additional months for every user that tweeted about their favorite way to use Trello. This is a great type of offer specifically for promoters. They create mutually beneficial behavior loops, helping both your company and your customer: it’s an upgrade, so customers will be happier and less likely to churn, but your product also gets a bit of great PR. Consider asking your best customers to spread the word about you. Sometimes, all it takes is asking nicely. I’m updating my website to include current testimonials, and I would love to brag that you are my client. I’m looking for a short testimonial about your experience working with me. Use an analytics tool like Mixpanel or KISSMetrics not only to analyze results on retention and churn but to examine the behavior of your 3 NPS-related segments. It’s easy to get obsessed with what detractors and passives are doing but your promoters’ behavior and activity provide a key to what’s working. Use these findings and insights to formulate incentives and strategies for carrying out NPS survey follow-up communication with less happy customers. The most critical thing to remember about NPS is that the number itself is pointless. It’s not quantum mechanics: just observing your results won’t do anything to change them. Running an NPS survey means opening up lines of communication between you and your customers — and doing so in a systematic way. NPS provides an incredible avenue to make an impact. It’s worth it to think about how best to close the loop. We’ve got more posts in the pipeline on how to do NPS surveys to improve retention and growth. Stay tuned by signing up for our newsletter below!